Network Techlab (I) Pvt. Ltd. helped in proper management of Data Center and resolving it’s Asset Management issues. The Company overcame it’s Data Center management issues with the help of Network Techlab’s prominent solutions. It is an India-based search services company providing search services all over India, via Phone, Web, Mobile and SMS. It is headquartered in Mumbai, Maharashtra. Users are required to call a common number and simply tell the human operator what service they are looking for. Text and email alerts are then sent to users listing the best options around them. 1. Design of Data Center layout covering the equipment under Civil, Electrical System, HVAC System, IBMS System, UPS System, Rack & Passive Network structure as per Tier- III guideline. 2. Implementation of Civil work, Electrical work, PAC work, IBMS work, UPS & PDU work and Passive network work for the Data Center as per Tier-III Design. 3. Detailed engineering of Data Center Infrastructure for coordination and operation of different equipment and their selection, protection etc. as per Tier-III standard. The main objective is to create benefits in physical infrastructure that streamline and simplify every process from initial planning to daily operations. 1. Isolated Data center which included Raised flooring (600 x 600 mm size) & Ceiling with floor Insulation. 2. Electrical room with redundant Main DC LT panel- Incomer Feeder – 315 Amp MCCB. 3. Emerson APM 60 kVA – 2nos UPS along with 120 AH x 34nos Quanta batteries with remote monitoring relay card. 4. Emerson PEX 135EC with iCOM for cooling. 5. Dedicated data center earthing pits. 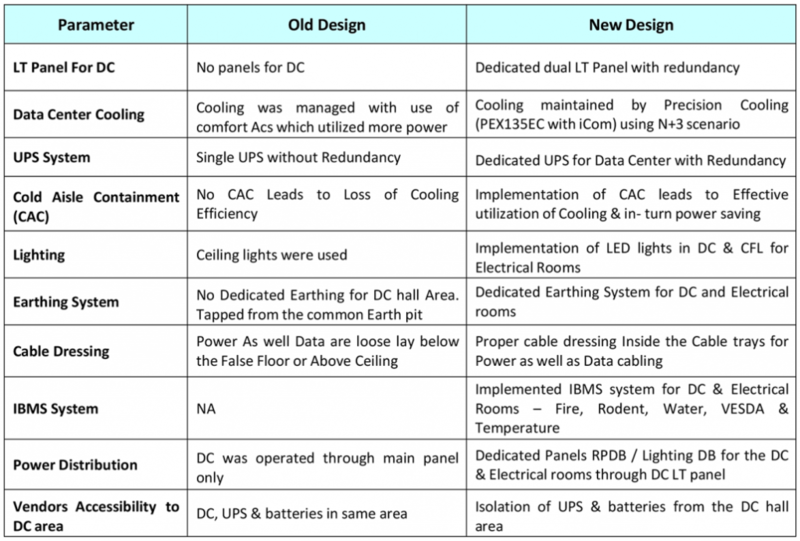 Improperly designed Data Center – Existing Data Center was not designed as per industry standards which included use of wooden flooring, jumbling of cables, overlapping of electric with network cables, no dedicated earthing. Hardware Failure – Frequent hardware failures including storage hard-drive crashes were observed resulting in huge loss of data & monetary losses. Improper Cooling – The existing air conditioning was inadquate and was unable to provide the required cooling to the data center, resulting heating of the servers. Unmanaged Electrical System – The power source available at site was impure containing harmonics in it, due to which power consumption was more than the required. Electrical panel was also in bad condition. Improper Utilization of Space – The placing of equipment’s was in random manner, which resulted in shortage of space in data center. This restricted proper maintenance of all the equipments present in the data center. Calling Line Drops – There was overlapping of electrical cables along with voice network lines which created interference resulting in call drops. Corrosion of ITE – Due to presence of sulphur in air, corrosion of ITE was observed due to which hardware life was reduced. DC Enterprise – Network Techlab created an efficient data center layout by organizing every element as per the requirements and industy standards. UPS Power Stability – We provided Liebert APM UPS. The row-based Liebert APM is a transformer-free, on- line uninterrupted power supply (UPS) that allows quick and easy capacity increases with Flex Power hardware assemblies–with no additional floor space required. Liebert APM operates with the industry’s highest data center power efficiency–up to 94% at loads of 50-100%. Dedicated Electrical Panel & Earthing – We provided dedicated LT Panels with redundancy for DC and also proper body & grid earthing was provided to all the DC equipments and racks. Also detailed SLD of wiring connections was prepared for future understanding and maintenance. Racks – Network racks were provided in which servers were mounted in proper order along with proper cable routings. This made the aesthetics of the room look spacious. Cold Aisle Containment – CAC was fabricated in such a way that a capsule like structure was produced which helps in isolating the hot & cold temperatures from each other. Cooling – Emerson PEX135EC with iCom board Precision Cooling system was installed having the configuration of 2 running & 2 standby mode which provides & maintains sufficient cooling ideal for Data Center. IBMS – IBMS system included Fire Detection Panel, VESDA assembly, Water Leak Detection Panel, Rodent Panel & DC Room Parameter Monitoring system. This system helps in detecting any of the hazards at early stage so as to prevent damage of Data Center & its equipments. Due to this designing of Data Center, the whole arrangement now has become properly organized and easy to manage. Power loss has been maintained resulting in cost saving. With organized arrangement of the data center, there is enough space for regular maintenance. Now they can monitor their rooms where critical equipments are present remotely which helps them prevent from any hardware risks. Network Techlab (I) Pvt. Ltd.